Martin Luther first published his 95 thesis in which he had contentions against the indulgences. The movement of Martin Luther found its own measure of success. Charles V, Emperor of the Holy Roman Empire in Germany was against Protestants. He felt that this revolt would not last long. But he had not counted on Luther’s ability to inspire his followers. People realized that he clarified the hidden facets of their faith by questioning the authority of the Pope. The Catholic Church suppressed certain facts. A public discussion of these facts would undermine the authority of the church. The vision of a better future arose in Germany. This promised a better future in religion, in politics and in the social life, which is the greatest of revolutionary forces. The people did not like chaos and also the external influence that they were facing. 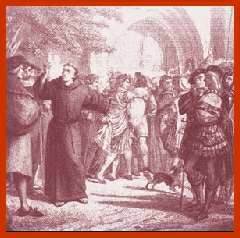 In 1517 Luther protested against the doctrine of the indulgences. He became the leader of the assault on Papal authority. The movement initiated by Luther also influenced the Peasants of Germany. In 1524, they rose in rebellion. They demanded the immediate abolition of the feudal order and of arbitrary punishments. They also pressed for free hunting and fishing rights and payment in wages for services rendered. Luther supported the peasants’ cause as long as their ire was directed against the Catholic clergy. However, many of the feudal lords were already Luther’s followers. In order to appease the latter group, he urged the peasants to make peace. The peasants refused to accept Luther’s suggestion. As many as 100,000 peasants were killed before the rebellion was quelled. This decimated the population of the peasantry to such an extent that for almost 300 years this group had no political clout. A more immediate result was the declining influence of Luther among the peasantry in Germany.